Healthy teeth and gums are crucial for a child’s overall health. Apart from playing an important role in food consumption and digestion, the lips, teeth, and tongue are also responsible for well-formed speech. Despite their significance, oral health is not taken care of by many children, leading to dental caries or cavities. In fact, 78.9% of children between ages 6 and 11 in India suffer from dental caries. Aside from being a public health problem affecting toddlers and pre-schoolers over the world, dental caries, if left untreated can cause severe pain and harm to oral health. What’s more, they also force children to miss school due to pain and can become expensive to treat. That’s why your dentist may recommend a solution that can help children avoid dental decay – fluoride varnish! Fluoride varnish is a dental product that contains a highly concentrated fluoride solution. The varnish is directly applied by a dentist or a healthcare professional on the tooth’s surface using a brush. Fluoride, the active element in varnish, is a mineral that helps in preventing cavities by strengthening the tooth’s enamel. In fact, according to a recent study published in the Dental Research Journal, fluoride varnishes can reduce the risk of caries by up to 63%! However, fluoride varnish treatment isn’t a magic bullet for cavity prevention as it requires regular brushing with a fluoride toothpaste, flossing, and biannual dental visits for best results. How Often Is Fluoride Varnish Treatment Required? According to international guidelines, 2-4 fluoride varnish applications are recommended in a year for the treatment to be effective. However, your dentist will examine your child and determine the number of varnish applications required on the basis of likelihood of caries formation. Can Fluoride Varnish be Used for Tooth Sensitivity? As approved by the American Dental Association, fluoride varnish can also be prescribed for tooth sensitivity. Tooth sensitivity or dentinal hypersensitivity is a condition the dentinal tubules of the teeth are exposed to external stimuli like temperature, pressure, and touch, among others. This causes a sensation of sharp pain, causing discomfort. When fluoride varnish is applied on the teeth, it forms a layer of calcium fluoride on the teeth that blocks the open dentinal tubules. Fluoride varnishes are safe and frequently used by dentists around the world. Since the application is directly over the teeth, a very small amount is used. Moreover, it also hardens quickly, ensuring that almost no amount of fluoride is swallowed by the child. It’s possible that after the application, the teeth may look yellow or dull. But, once the varnish is brushed off, the color returns to normal. 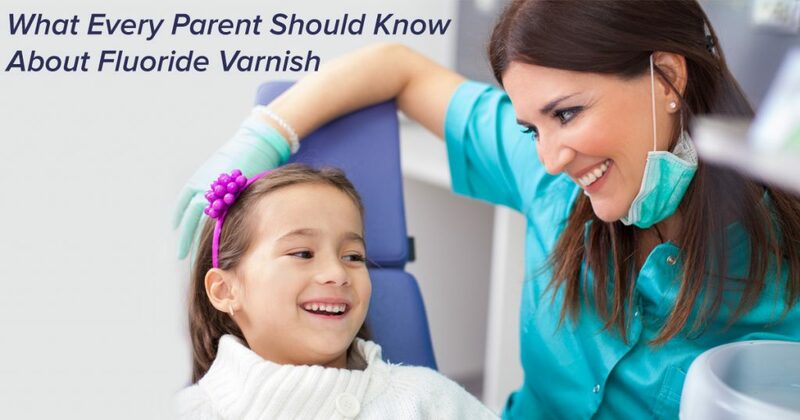 The only reason why your dentist may not recommend a fluoride varnish is if your child is allergic to any of the ingredients used in varnishes. Furthermore, if your child has noticeable sores in the mouth or on the gums, the dentist will reschedule the application procedure when the sores are healed. Fluoride varnishes are comparatively less expensive, easy to apply, and can increase the odds of keeping your child’s teeth strong and cavity-free. If you’re considering opting for fluoride varnish treatment, contact your dentist, and he or she will guide you through the procedure.